We are a congregation of the Evangelical Lutheran Church in America. Take a look at the ELCA’s mission and vision. transforming human life into Christlikeness through practicing Christian community. 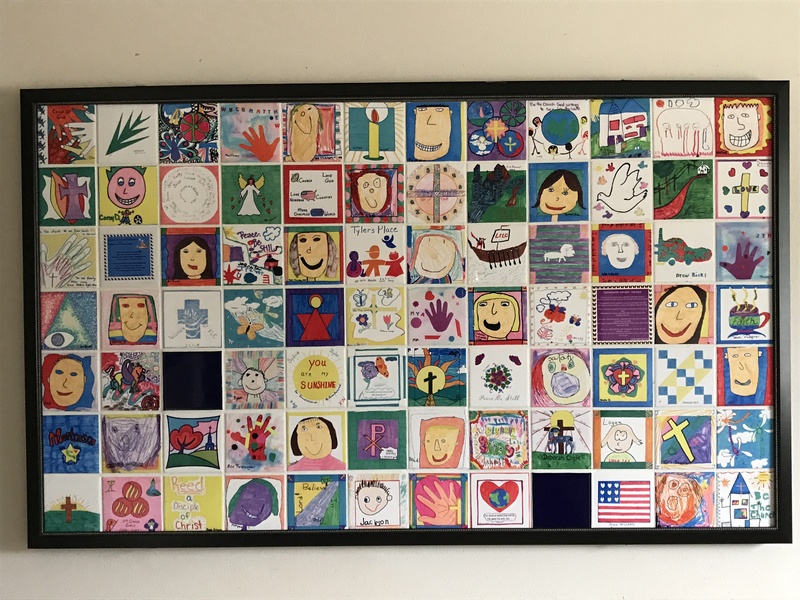 The people of First Lutheran Church partner with the triune-God and our local and global neighbors for healing and flourishing of the whole Earth (Romans 8:18-25). 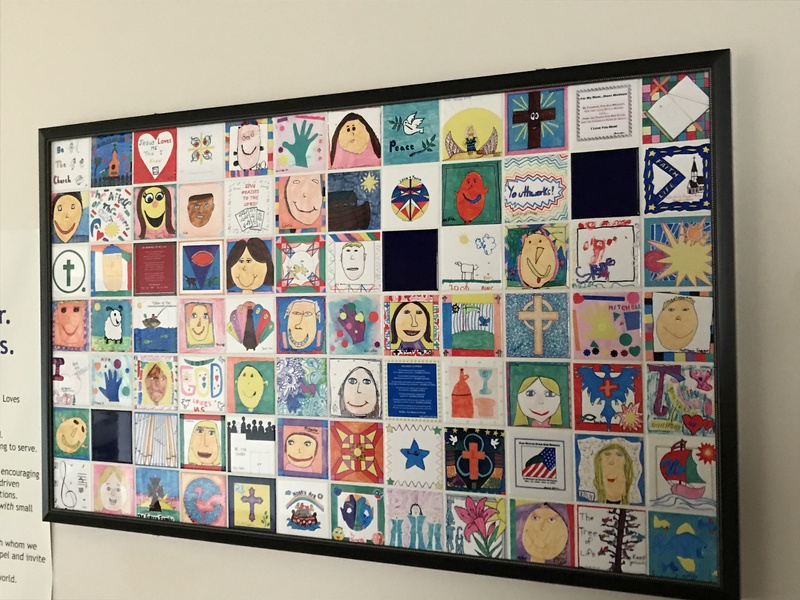 Locally for us means the Lodi Area School District and the South-Central Synod of WI. 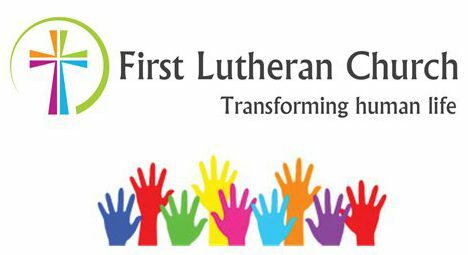 Our denomination, the Evangelical Lutheran Church in America, is a member church of the Lutheran World Federation (LWF) and an ecumenical partner with many other denominations, faith traditions, and ministries nationally and worldwide. (“The LWF is a global communion of 145 churches in the Lutheran tradition, representing over 74 million Christians in 98 countries.” Source: https://www.lutheranworld.org/content/about-lwf). The triune-God is in the business of transforming human life into Christlikness and redeeming the whole Creation (locally for us, the zip codes around Lodi, Dane, and the Lake WI area). The mission of God in the world includes, but is not limited to, the church. God’s redemptive reign is more expansive than the church in the world. We participate in the redemptive mission of God as we practice Christian life together in communion with the triune-God and the Creation. We root our Christian practice in the Lutheran theological tradition. Grounding our energy and imaginations in God’s mission first versus being overly preoccupied with the local church’s institutional elements (programs, local history, budgets, etc.) can be understood as the missional turn. Institutional elements matter but only in relationship to how well they serve God’s mission and the faith community’s call within God’s mission. The faith community’s institutional elements and structure find legitimacy in the contextualization of the mission of God locally. Meaning, forms of ministry are not the end nor the point of the church’s life together. Form can adapt and change with the Triune-God of mission. We confess the missional turn is the work of the Holy Spirit in our congregation and runs counter to human nature in anxious times. The missional framework helps not only guide our work but checks our motivations and presuppositions inducing our habits and routines. Specifically, the turn means we start with the mission of the triune-God to discern the vocation (calling) of the local church. The local church’s vocation is never not about God’s mission. Missionally-inspired questions that we wrestled with for years have been, What does God hope for us? What does the church do that no other organization does in our community? What is the church’s unique contribution to the common good? These questions really point back to who God is in the world and how the church fits within God’s mission. Be the Church: Love God, Love Neighbors, Make Disciples. This work remains crucial to congregational vitality in a world of continuous flux and growing complexity. Gil Rendle, a church consultant states it this way, “Mission statements are static. Conversations about mission statements and mission are not.” (Source: Clarity in Ministry Workshop, May 2006, UW-Madison). 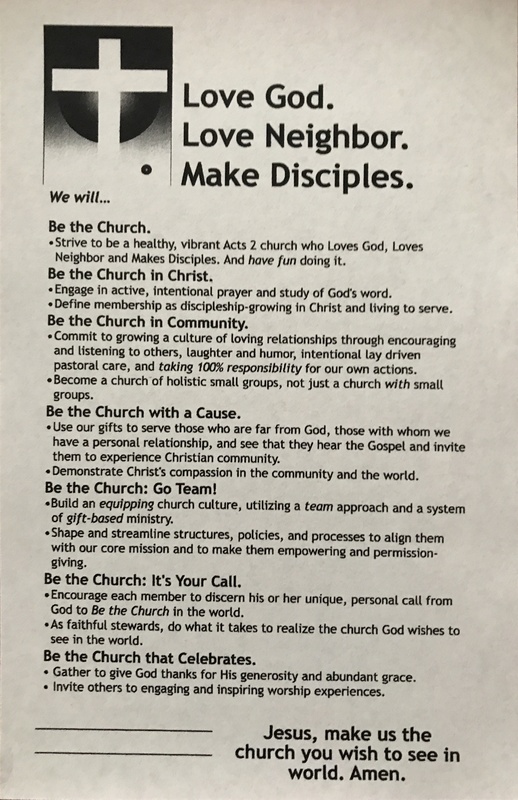 The mission statement developed in 2005, Be the Church: Love God, Love Neighbor, Make Disciples, helped generate crucial meaning-making conversations that became ministry in action and a way to then reflect on our practice. And so the iterative cycle goes, ideas, action, reflection, further action, etc., and the reason our congregation always remains in process through the work of the Holy Spirit. Our ongoing mission conversations start by asking, What does God hope for our local community and our part in it? What is God already doing in our community based on our active, ongoing listening to actual members of our local community? How do we form partnerships for the common good with an awareness of our particular, theological perspective and how it can contribute something unique and life-giving to the effort? How have we become more mindful to include marginalized voices in our society? We discern how we might join what God is already up to locally versus creating programs that attract more potential members to our church. Faith milestones were emphasized from birth through death, and how we as a congregation can accompany families on their journey of faith, e.g., baptismal/birth care baskets, interactive Holy Communion workshops, Seder Meals, etc. Parents were challenged to live into their baptismal identity and primary faith forming role in their children’s lives rather that dropping kids off for “kids’ programming; LOGOS was developed out of this idea of all-ages, cross-generational ministry on Wednesday nights. A Food Cart mission start called, Table of Joy, now a part of Good Shepherd Lutheran, Madison. The Development of Be the Church Vision and a Big Idea eventually led to the vision of transforming human life into Christlikeness through practicing Christian community in 2015. More detail about these developments can found at the webpage archive of Be the Church and the Big Idea (the vision and calling of First Lutheran). Hint: It has a lot to do with discipleship, i.e., whole life spiritual formation and apprenticeship in the image, manner and mission of Jesus the Christ. We now find ourselves at another critical juncture in our congregation’s journey. God’s working in us a new thing and we are again engaging in basic questions about our church’s vocation, including God’s vision for the next season of ministry. We hope you can join us in this rich, prayerful dialogue with God for the sake of a just and loving world for all. First Lutheran Church, Lodi, WI, was forged in 1878 through the merger of two congregations with Norwegian immigrant roots extending back to 1845.
WHO IS FIRST LUTHERAN CHURCH TODAY? It is the church distributed in the world, locally and globally. …so we, who are many, are one body in Christ, and individually we are members one of another (Romans 12:5). And, the Spirit of God is conforming us to the image of Christ in our life together for the sake of the world (Romans 8:29a). Many of us, maybe like you, are acutely aware that the world in which we live is confronted with complex problems and vexing questions that do not lend themselves to easy fixes or solutions. Gratefully, people who constitute the membership of local congregations throughout the world are addressing and working on many of the challenges and questions confronting us today. Meaning, the Church via its members’ vocations in the world is engaged in serving the good of the world. What does it mean to be a local practicing Christian community today? You are invited to prayerfully consider this community journey with Christ at the center. WHAT IF I AM NOT A LUTHERAN? For starters, Martin Luther was not a Lutheran. While our denomination may have particular core theological convictions that help us understand the meaning of Jesus and the Gospel (good news) for today, and therefore, cast an image of Jesus in a manner reflecting our commitments, we are a diverse group of folks. and, of course, everyone else in between. Even with such varied experience and faith expression, our collective focus is following Jesus as Lord of our lives and the world. Our vision is to be the church not only in a building for weekly worship but everyday, everywhere and with everyone – loving God, loving and serving our neighbor and growing apprentices of Jesus.